Calligraphy is about creating something uniquely beautiful, whether to celebrate a special occasion like marriage or to use every day in the form of stationery. 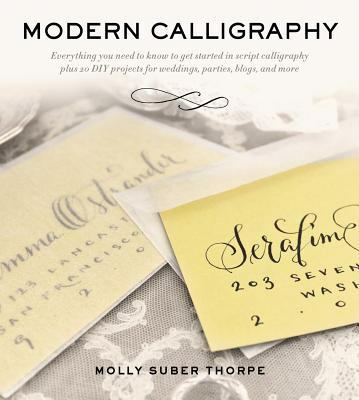 Author Molly Suber Thorpe, an award-winning designer and calligrapher based in Los Angeles, works closely with her international clients to give them the distinctive products they’re looking for. Now you can learn from this experienced expert how to master this fresh modern lettering style. The first book to teach this bold new style breaks the calligraphy process down into simple steps so anyone can learn to create their own stunning wedding invitations, thank you cards, gift tags, and more in Modern Calligraphy. Starting with an overview of the supplies–from paper to ink to pens–you will learn how to form letters, words, and then phrases by following Molly’s clear step-by-step instructions, and by practicing with the provided templates. After mastering letter forms using a pointed pen and ink you can take it to the next level by learning how to use watercolor and gouache, or how to digitize your calligraphy. The twenty projects in the book provide lots of inspiration for making your own and are grouped into three sections: weddings, entertainment, and personal stationery.